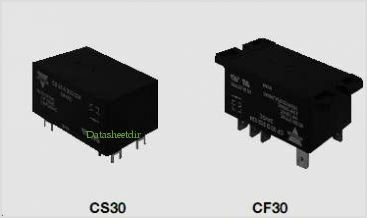 Power Relays Type CS30/CF30 Monostable , Compressor control relay Switching capacity 30A DC coils 6 to 48VDC AC coils 24 to 277VAC 2 normally open contacts, 2 change over contacts Reinforced insulation 4kV / 8mm (0.31”) Meets class F construction PCB or Fast-on terminal General purpose, power loads Standard as sealed CE, UL approved By Carlo Gavazzi Inc. This is one package pinout of CS30A00212,If you need more pinouts please download CS30A00212's pdf datasheet. CS30A00212 circuits will be updated soon..., now you can download the pdf datasheet to check the circuits!